1) Set the date display format to "iso". 2) Try editing the date. 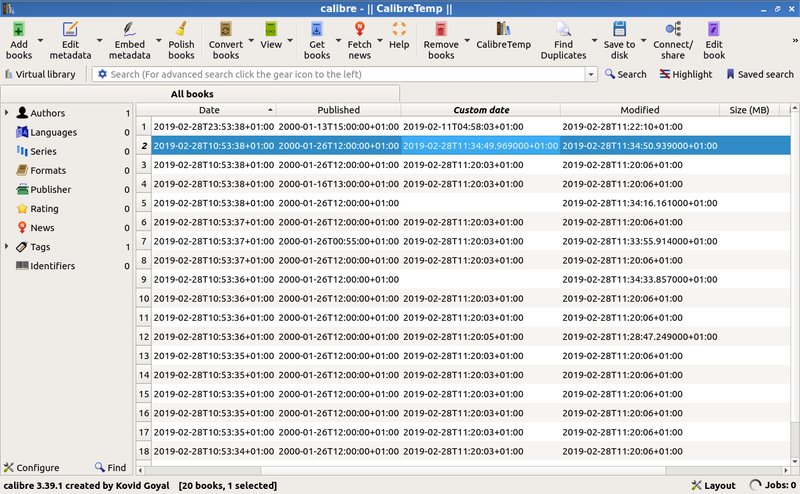 II) in the edit metadata dialog, the current month and year are shown, instead of the actual date; month and year alone may or may not be modifiable: I have not attempted for fear of data corruption. B) For custom columns, attempting either way of editing results in the date being shown as "i15o" and such. Set the date display format to "yyyy-MM-ddThh:mm:ss", or equivalent, instead of "iso". In order to prepare for my previous bug report (LP: #1812539), I had to switch my time zone a few times from CET to UTC, and back. Upon finally returning to the original time zone, I noticed that some of the dates (perhaps even many or most; I can't check, lacking a recent backup) had gone back a day (which may be a bug in and of itself, but one I'm presently too lazy to report separately). Since CET is one hour (or two, during DST) ahead of UTC, I surmise that the affected dates where those with time 00:00:00. The purpose of editing the full ISO string was to try to prevent this from happening again. This is a rat's nest. QDateTimeEdit doesn't have any method I can see to edit the timezone, so the best that can be done is to edit the date with 'yyyy-MM-ddThh:mm:ss' with the timezone hidden. The timezone is preserved, so the resulting datetime will be in the original timezone. I will push changes to this effect because the behavior is better than doing nothing, but people interested in manipulating the timezone portion will not he pleased. I am not interested in making a timezone-aware QDateEdit widget. Thank you. However, this fix seems to have introduced an unexpected change. If you set a date to "today", fractions of a second are also shown (see screenshot). If you restart calibre, everything goes back to normal.